Like science, mathematics is a kind of game that we play with the universe. The best mathematicians and the best teachers of mathematics obviously are those who both understand the rules of the game, and who relish the excitement of playing it. If you are reading this blog, you've probably heard of Gardner before: anyone who enjoys recreational mathematics is bound to stumble upon Gardner's books (a near-inexhaustible resource), and his stature seems to have only grown in recent years despite the fact that he stopped writing his influential Mathematical Games column in the early 1980's. Something new for Gardner's many readers is his new autobiography Undiluted Hocus-Pocus, written just prior to his death in 2010. Gardner at times criticizes his own text as slovenly and disheveled, but its casual tone and associative leaps makes it an enjoyable read that conveys a strong sense of Gardner's personality. 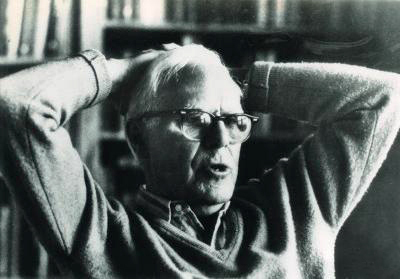 Why is an autobiography of Martin Gardner of interest? I have to admit that what first pulled me in was curiosity about the many personalities that Gardner knew and could tell stories about. He was a friend of many eminent mathematicians and skeptics, and his work as a popularizer of math and science brought him into contact with other, more mainstream, media celebrities. Hocus Pocus (particularly chapters 14 through 17) covers this period nicely. The path of Gardner's surprisingly successful journalistic and writing career is also a worthy tale - his leap from writing limericks and designing puzzles for a children's magazine to writing in Scientific American [confirms how truth can be stranger than fiction]. Gardner's success is even more surprising than a quick look at his career would suggest. His interests were as far away from the cultural mainstream as you'd care to wander: magic, mathematics and skepticism. Even within those communities, Gardner seemed to be on the periphery: a non-performing magician; a self-educated mathematician who wrote popular accounts on recreational mathematics; a skeptic who believed in god. Even his literary interests tended towards the neglected and and unfashionable: Frank Baum, C.K. Chesterton, and Lewis Carroll were his literary icons. But despite lacking insider credentials and having unpopular interests, Gardner became an icon. In mathematics, his impact has been particularly significant: many working mathematicians today credit his writings as sparking and sustaining their interest in mathematics, and of the small fragments of mathematics that have made their way into popular culture, many were introduced to us by Gardner (Conway's Game of Life, Penrose tiles, Surreal numbers, the art of M.C. Escher, fractals, polyominos, to name a few). Through Undiluted Hocus-Pocus, we get some clues that help explain the Gardner enigma. Gardner never claimed to be a mathematician, magician, or professional skeptic - only a journalist, and being a journalist and a writer is what he worked hard at. He broke that so-called first rule of writing: instead of writing what he knew, he wrote of what he wanted to know, which lead him not only to much of his mathematical writing, but also to write books on Relativity and the philosophy of science. He sought out and maintained many intellectual friendships and correspondences that brought him new ideas and topics. In following where his interests and friends led him, he seems to have encountered each new topic as a game - and the playfulness at the heart of much of his writing is the key element that hooked his readers and drew them in. I was surprised to learn how strong and sustained interest in religion and theology remained throughout his life. The books he spends the most time describing are his religious-themed The Flight of Peter Fromm and his personal philosophical statement The Whys of a Philosophical Scriviner. Gardner's rational and skeptical views and his love of science made him a critic of organized religion, but his early and deep induction into religious belief seem to have held on in the form of a personal pragmatic theology, greatly influenced by the writings of William James (whom he references often). A last bastion of irrationality in Gardner's world view, and his insistence of the ultimate mysteriousness of consciousness, may put off readers who encountered him through his writings on science and skepticism; and the casual certainty that makes his expository mathematics writing so readable doesn't suit his philosophical commentary as well. Gardner's philosophical views are not incongruous with his love of mathematics, however - they are a reminder that mathematics provides people, whatever they believe about the world, a game that everyone can play. Undiluted Hocus-Pocus reminds us how Gardner taught many of us how to play the game of mathematics better.